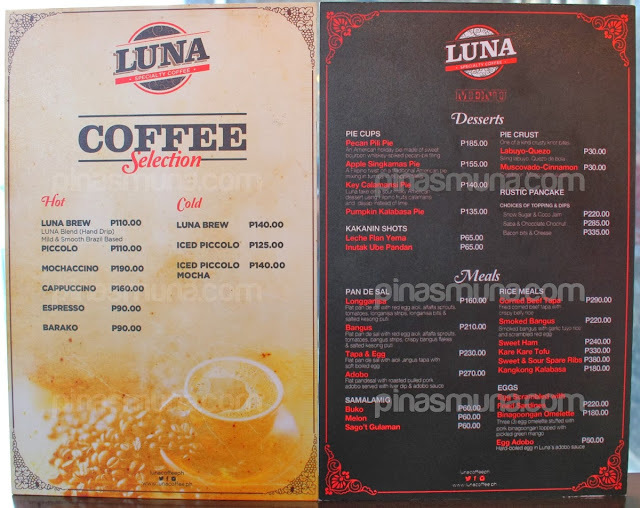 Luna Specialty Coffee (Luna Coffee) is a newly opened all-day Filipino breakfast cafe in Bonifacio Global City (BGC) in Taguig. 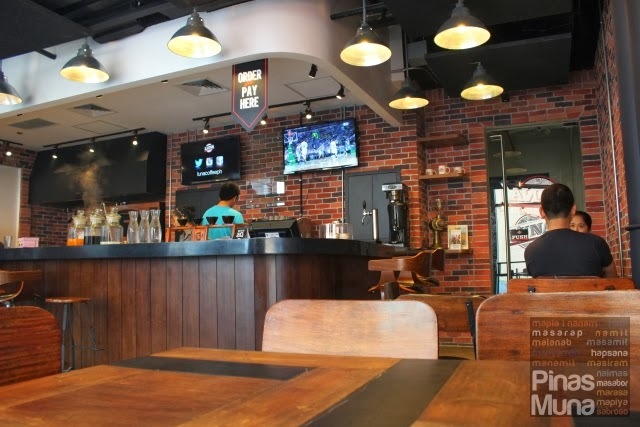 This Filipino coffee shop is owned by Taguig Rep. Lino Cayetano and his business partners. 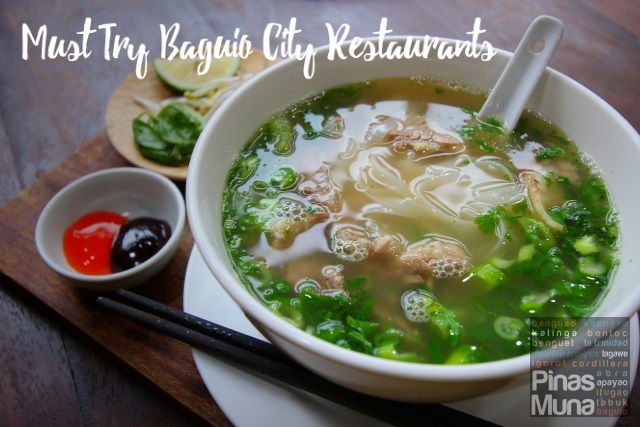 It specializes in Filipino breakfast meals and coffee prepared with a creative twist. 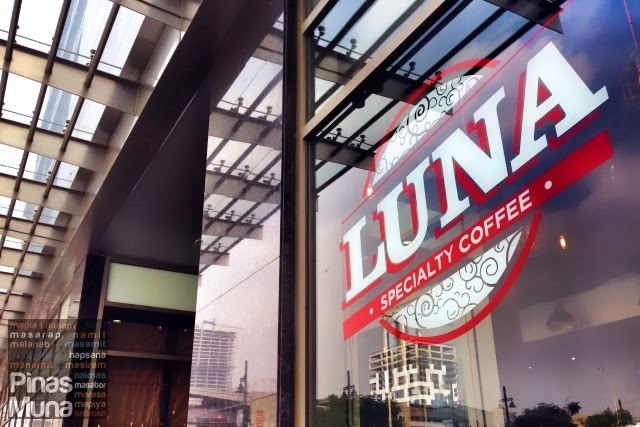 Luna Coffee is still running in soft opening but has quickly gained popularity especially from the employees working in same building as and nearby offices of the cafe, as well as from the weekend morning joggers of Bonifacio Global City. 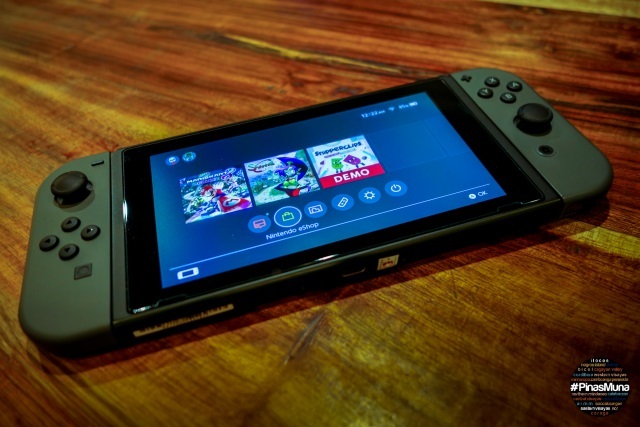 We don't think it's just a fad because they really do serve great food and coffee, and these are the reasons why Luna Coffee's patrons keep going back. It was a Saturday morning when we visited Luna Coffee and the first thing we ordered was their Luna Brew (P110). It intrigued us so much because of the unique way of preparing this coffee. 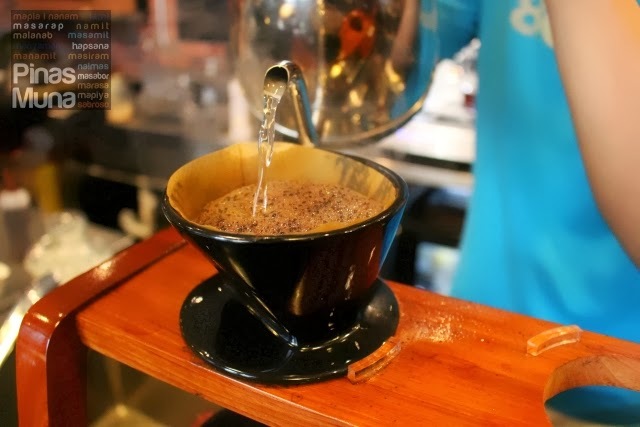 The technique of hand-brewing coffee originated from Japan, and the Japanese precision and attention to detail are also translated in this technique of coffee brewing. There is a precise timing involved in the process. 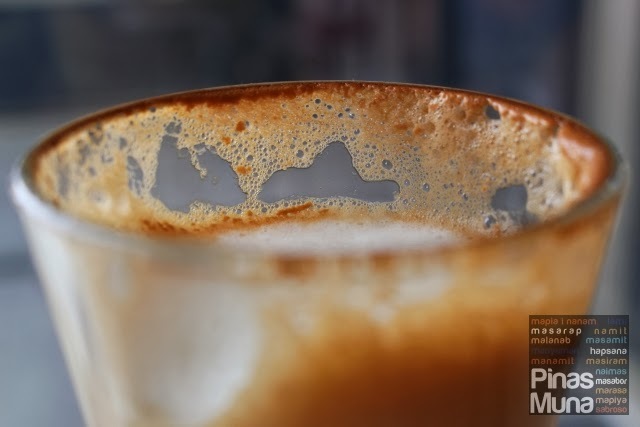 A small amount of hot water is first poured into the filter allowing the ground coffee beans to "pop" forming a foam of ground coffee and bubbles. This step allows the ground coffee to release all the flavors into the hot water. The "pop" is a sign that the coffee beans used are fresh. The barista will then count seven seconds before hot water is once again poured to fill the filter. This time, all the flavors will then be captured by the hot water before the brewed coffee drips into the cup. We also tried Luna Coffee's Cappuccino (P160). What's very interesting about their cappuccino is the type of container they used to serve this coffee. Traditionally used in France to serve café au lait, Luna Coffee uses these French coffee bowls for their Cappuccino. It is then served with three pieces of hopia, an unusual but surprisingly perfect combination. The coffee bowls are originally designed to keep the hands of the coffee drinker warm during the cold months in Europe. We don't experience cold winter-like temperatures in the Philippines, but we do still find drinking-coffee-in-a-bowl a very interesting experience, especially during the Christmas season. Rep. Lino Cayetano chanced upon us when we visited Luna Coffee and had us sample their Iced Piccolo Mocha (P140) and Hot Piccolo Latte (P110) as well. Both are placed in small glass containers and wow, they are very intense. These two finally got us awake. 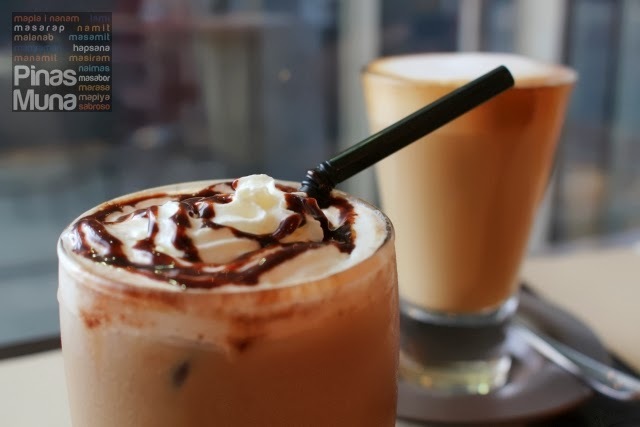 We personally prefer the Hot Piccolo Late, but if you are looking for a chocolaty drink, then we recommend the Iced Piccolo Mocha. 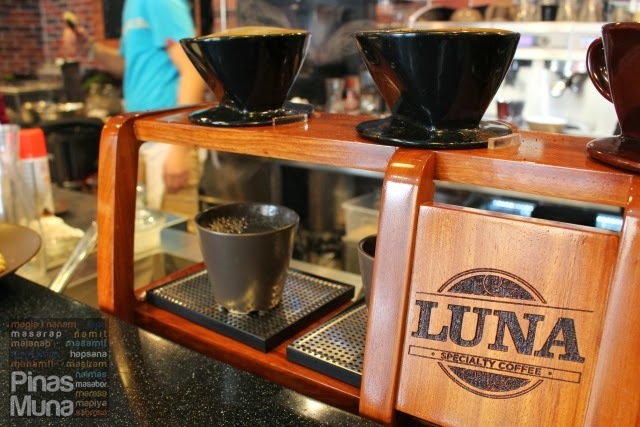 Luna Coffee uses high quality and fresh Arabica coffee beans. What's their secret? A bag of beans is meant to be used out within a specific number of weeks, and any beans unused after that period will be discarded. This is their way to make sure that they serve high quality coffee all the time. 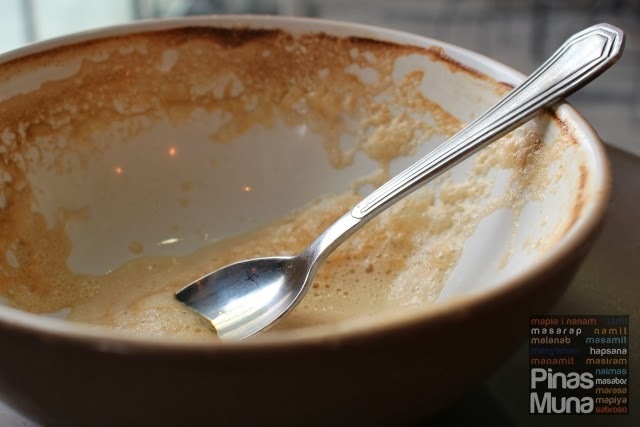 Now let's take a close look at Luna Coffee's breakfast offerings. 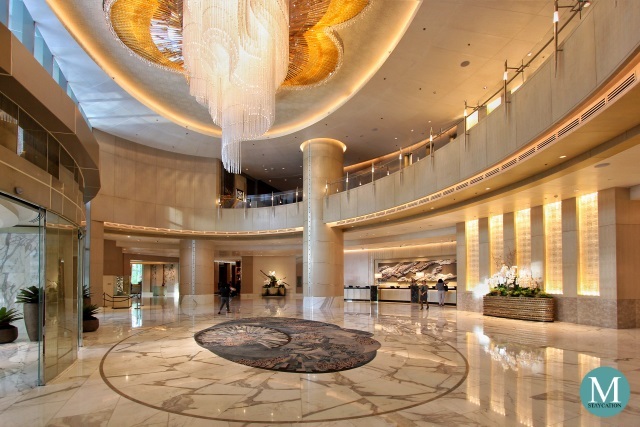 First of all, you will notice that they have an open kitchen set-up. They prepare the food right in front of the customers. We always enjoy watching how our food is made because we could see how much labor and attention is put into them. We also get to appreciate the food better. For breakfast, we ordered Luna Coffee's best-sellers. We first sampled the Corned Beef Tapa (P290). The corned beef used is not the canned type ones common in supermarkets, but the salt-cured beef type typical in western cooking. These are then sliced and fried like the Pinoy beef tapa. Some customers might find it too salty, but that's quite natural because corned beef is salt-cured. The rice served with the tapa on the other hand is not salty so the rice will tone down the saltiness of the tapa. 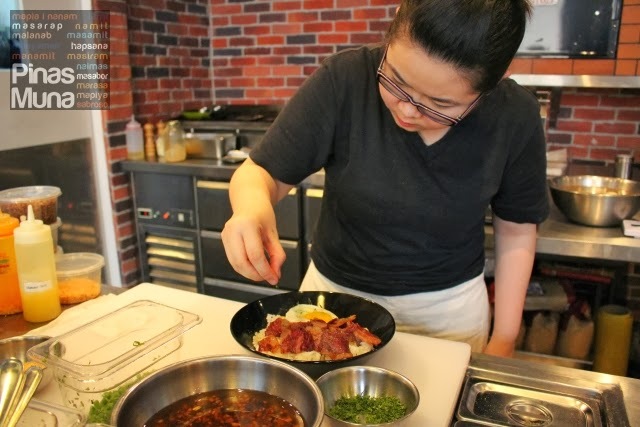 The meal is also served with a sunny side up egg, un-salted so it will also help in toning down the saltiness. 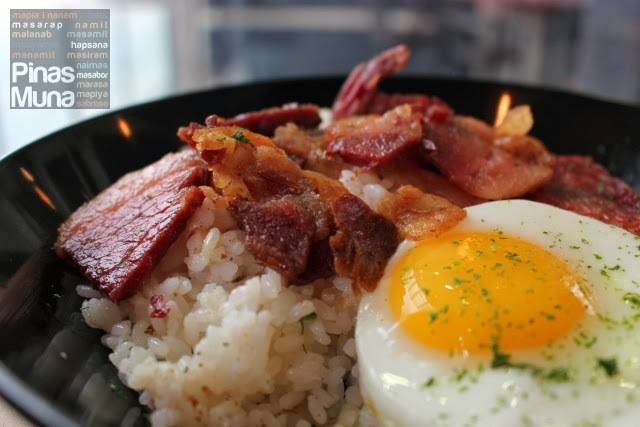 Overall, the flavors of the corned beef tapa plus the egg and the rice balance each other out, resulting to a savory dish that you would love to have anytime of the day. We then tried the Longganisa Pan de Sal (P160). 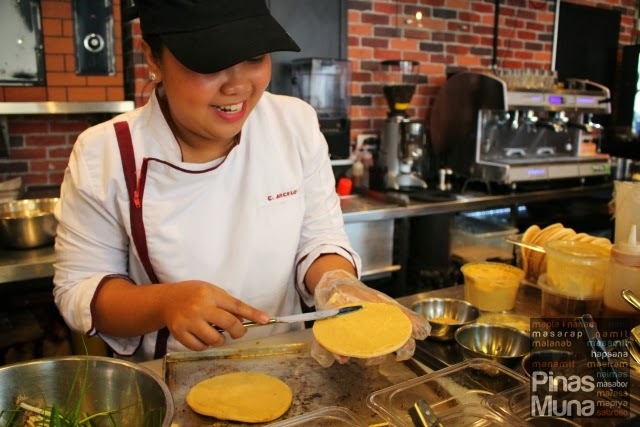 Luna Coffee bakes their own flat version of the pan de sal. They look like pita bread but taste like pan de sal. You may be wondering why make them flat? 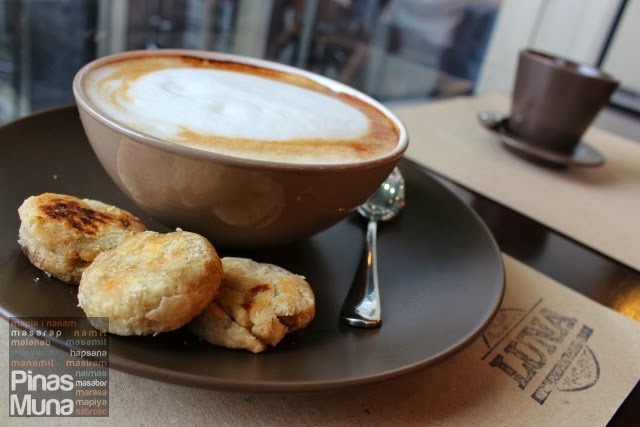 We think it's because Luna Coffee wants to showcase the richness of the ingredients and the artistry involved in the presentation of their pan de sal meals. 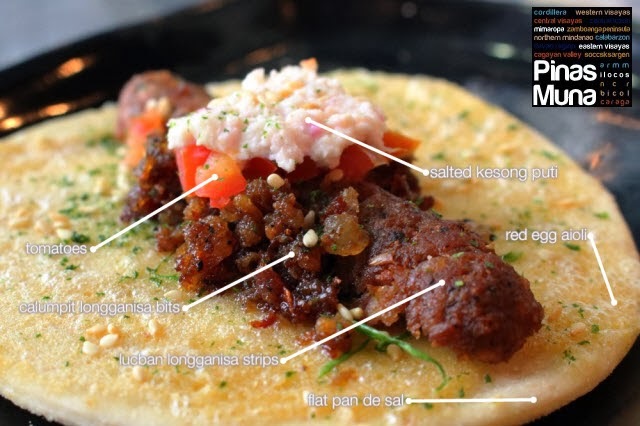 Here's the anatomy of what makes their Longganisa Pan de Sal. It starts with red egg aioli spread on top of the flat pan de sal. 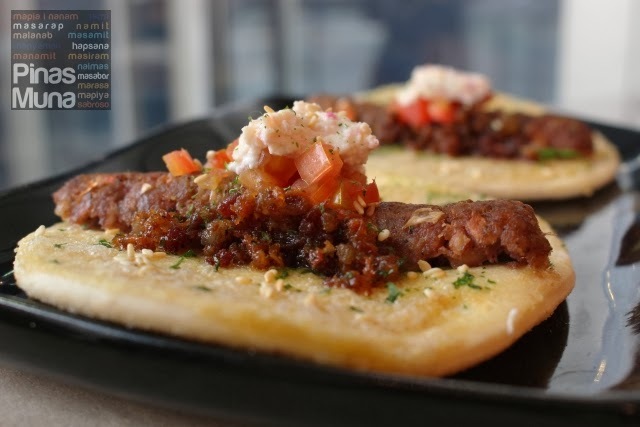 A Lucban Longganisa is then sliced into two, and placed on the cross-section of the bread. Bits of Calumpit Longganisa are then placed on both sides of the Lucban Longganisa slices. The center is then topped with diced tomatoes and salted kesong puti. They are then placed in the oven for a few minutes to allow all the flavors to set. Finally, they are seasoned with sesame seeds. The best way to enjoy this sandwich is by folding the flat pan de sal and eat it like a soft taco. There's no need for sauce or dressing because it is already flavorful in itself. We love the garlic flavor of the longganisa, not too strong and not to flat. The tomatoes gives juiciness and freshness to the sandwich while the salted kesong puti adds more flavor and character to it. Overall, we see Luna Coffee as a place where we will have more of our breakfasts and coffee sessions in the future. We loved their food and we will keep coming back for more, hopefully to try their other breakfast offerings. 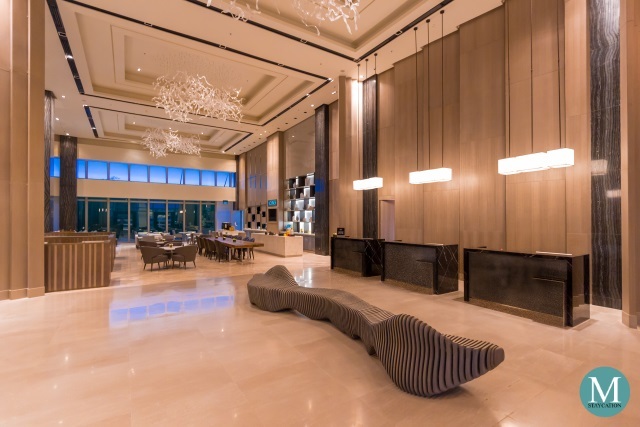 There's so much more to try from their menu, and new items are being added on the menu. We also want to try some of their desserts, especially the pie cups. 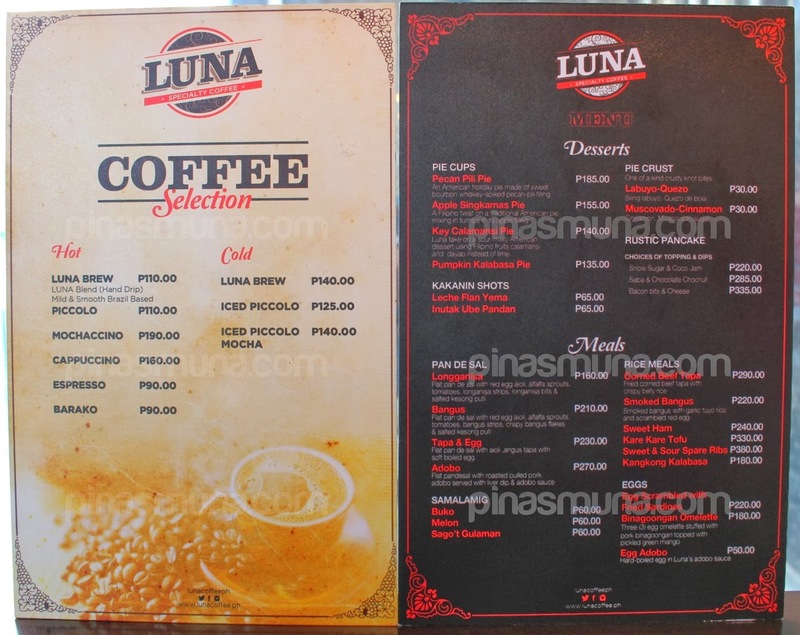 Luna Coffee is located at the ground floor of NAC Tower. 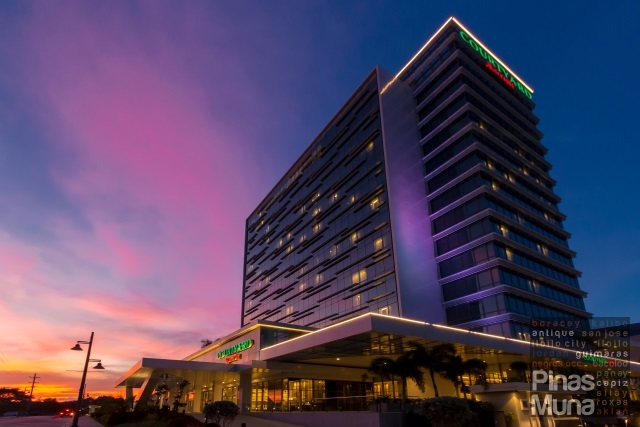 That is along 32nd Street of BGC, right across the cluster of restaurants beside the Starbucks Drive-Thu branch. If you are driving, the best place to park your car is on the parking lot adjacent to the cluster of restaurants. During weekdays, the cafe is usually packed during lunchtime and dinnertime. They currently only accepts cash payment.